“Conjuring Casanova” by Melissa Rea is a delightful romantic tale about an ER physician, Elizabeth Hillman, and her encounters with the most infamous rogue of the eighteenth century, Giacomo Casanova. Elizabeth hasn’t had the greatest luck with the men in her life so for her, cozying up with the memoir of the legendary lover seems like the safest and best antidote. When a young child dies tragically in the ER under her care, Elizabeth is put on administrative leave and uses her time to take a much-needed trip. She escapes to Venice, staying in a hotel that was once the home of her Italian obsession. When Casanova shows up one morning beside her on the rooftop of her hotel, things get very interesting! Melissa Rea is a fantastic writer. I became a huge fan before I even got to the first chapter of the book. She completely won me over with the Table of Contents – tagging every chapter with the name of a famous song, which she then wittingly incorporated into the story. Her quick wit and obvious sense of humor shine throughout the narrative, as does her expertise in the subject. 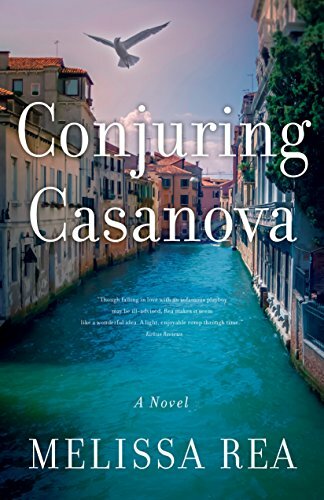 “Conjuring Casanova” is a skillfully crafted, delicious tale, successfully integrating contemporary romance, time travel, history, and intrigue. I’ve heard many accounts and read several stories about this legendary ladies man, but “Conjuring Casanova” certainly brings a unique spin to the table. The characters are extremely well developed and really take the center stage. Of course, Casanova is Casanova, and though there are limitless ways in which he could be portrayed, watching him grow and adapt to life in the twenty-first century felt convincing and realistic. Elizabeth is a respectable, intelligent female protagonist and I appreciate that she was not a “perfect” subject, but had genuinely relatable issues regarding her friends, relationships, and her own body. "Conjuring Casanova" by Melissa Rea is simply a must-read for all fans of contemporary romance, historical fiction, and time travel. I can’t wait to see more work from this author. Five stars for this exceptional story.